Michele Stocker '83 is Vice Chair of Pine Crest School's Board of Trustees. Michele is a shareholder with Greenberg Traurig, P.A. She is the Chair of the Firm's national Financial Services Litigation Practice group. In that capacity, she regularly defends financial institutions, mortgage loan servicers, third-party debt collectors and debt buyers in litigation brought by consumers arising out of credit transactions. Michele is a graduate of Pine Crest School. 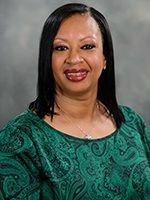 She is very involved in the community and serves as a board member for the Children's Home Society, NSU Museum of Art, and the Crockett Foundation. She also serves as a Member of the Orange Bowl Committee. Michele is proud to have her daughters Savannah '19 and Sierra '21, and nephew Chase '26 attending Pine Crest and continuing the Panther tradition.